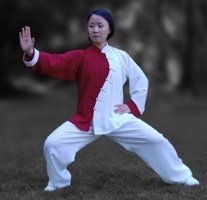 Yan Li (李 艳) is a level II Chen Style Taijiquan (Tai Chi) instructor certified by Qingzhou Taiji Institute in Wenxian, Henan Province, China, the birthplace of the internal martial art Taijiquan. Yan holds gold medals for her Chen Taiji performances at regional Martial Arts Tournaments in multiple years. She and her students currently offer public Chen Taiji classes in the San Francisco Bay Area and in Portland, OR. A native of Harbin, China, Yan had dabbled in Qigong as a teenager and in standardized Taijiquan as a college student in Beijing. Later, while in graduate school in the San Francisco Bay Area, she studied Chen Taiji under the close tutelage of Sifu Tony Wong (Wong Wai Yi 黃偉兒), a 20th-generation Master and indoor disciple of the late Grandmaster Chen Qingzhou (陈庆州) of Chen Family Taijiquan Zungu lineage (尊古, “Reverence for the Ancient”). In addition to studying with Sifu Tony, she has also trained with world-renowned Taiji masters from the Chen Village, such as Grandmaster Chen Qingzhou (陈庆州) himself, the current Chen Taiji Standard Bearer Grandmaster Chen Xiaowang (陈小旺), Master Chen Youze (陈有则) and Master Chen Bing (陈炳). With each teacher, Yan’s fascination with Taiji as a profound martial art and healing system grows ever stronger. “Taiji belongs to the world,” Sifu Tony often quotes Grandmaster Chen Qingzhou. Yan is grateful to Sifu Tony for opening the world of Taiji for her, and hopes to spread the art in the same open spirit as Sifu Tony and her other teachers. Yan’s public class offerings in the SF Bay Area can be found on the classes page, and she visits Portland, OR annually to hold Chen Taiji workshops. Professionally, Yan has worked as a college professor and a social science researcher. In her limited spare time, she enjoys Argentine Tango, a richly expressive art form which, in delightful ways, shares many of the Taiji principles.